Following up to three albums on Kompakt since 2011, the latest being 'Signs Under Test' (KOM321/KOMCD119) in 2015, Los Angeles based house and techno producer John Tejada returns to the Cologne-based imprint with his thirteenth full-length, 'Dead Start Program' - an eleven-track journey spanning a prismatic array of styles and patterns, from John's signature soulful techno tunes to the further mazy, hypnotic motifs of his trancey electro hybrids. Be it solo or through a host of multifaceted collaborations, Tejada keeps himself busy on all fronts in and off the club environment, be it by contributing the 44th number in Fabric's seminal mix series, playing drums for Detroit legend Daniel Bell (as DBX), testing the limits of acid with Tin Man or joining forces with the hilarious self-proclaimed "disinformationist" Reggie Watts as Wajatta. Since his beginnings and the drop of his debut 12", 'Waxing', released through his own label Palette Recordings over twenty years ago, John has been carving out a lane of his own - combining and assembling elements from all ends of his wide-spanning spectrum of reference in a way that allows a more direct transition from the realm of the mind to the circuits of the machine, as confirmed by the deliberately limited studio setup used in the making of the present album. Navigating across the lines, from the arrhythmic machine spook of the album's opener 'Autoseek' via the straight out thumping and jacking pulse of 'Hypochondriac' and heavy-lidded breakbeat of 'Sleep Spindle' onto the kosmische-infused vibrations of 'Telemetry', vibrant slo-mo inertia of 'Loss' and wistful club-ready winds of 'Duty Cycle' and 'Heal', John threads his way through genres and tempos with optimal chameleonic effect. Cloaked in a beautiful sleeve art courtesy of John's long time friend Juan Mendez aka Silent Servant - another key contributor to the Los Angeles scene worldwide, based upon a picture by Mark Richards, 'Dead Start Program' draws its title from the analog start up program used to boot an old CDC 6600 computer from a dead start and which metaphorically invites in John's own words to figure a "reboot from the challenges life throws at you". A beautiful collection of tunes as striking as they are subtle. Nach drei Alben auf Kompakt, zuletzt "Signs Under Test" im Jahr 2015, kehrt der US-amerikanische House- und Techno-Produzent John Tejada mit dem Elf-Tracker „Dead Start Program" zum Kölner Label zurück. Eine Reise, die das Spektrum von John’s Stilen umfasst - von seinen charakteristischen Soul-Techno-Melodien bis hin zu den hypnotischen Mustern seiner Trance-Electro-Hybride. Ob Solo oder durch seine Vielzahl von Kollaborationen - Tejada beschäftigt sich mit allen Elementen innerhalb und außerhalb der Club-Umgebung. Sei es auf seinem (44.) Fabric Mix, als Schlagzeuger mit der Detroit Legende Daniel Bell als DBX, mit Tin Man auf Acid Test oder mit dem selbsternannten "Desinformator" Reggie Watts als Wajatta. Vom arrhythmischen Maschinenspuk des Openers „Autoseek" über den hämmernden Puls von "Hypochondriac" und dem schwerlidrigen Breakbeat von "Sleep Spindle" zur kosmische infundierten Vibration von 'Telemetry’, der lebendigen Trägheit von 'Loss' und clubbigen Winde von 'Duty Cycle' und 'Heal' bahnt sich John auf ‚Dead Start Program‘ seinen Weg durch Genres und Tempi mit optimalem Chamäleon-Effekt. 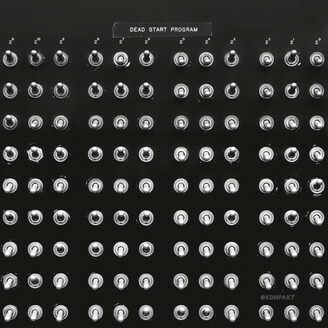 Das Artwork, basierend auf einem Bild von Mark Richards, wurde von Johns langjährigem Freund Juan Mendez aka Silent Servant, ein ebenfalls wichtiger Mitwirkender der Los Angeles Szene, designed. Der Titel „Dead Start Program" bezieht sich hierbei auf das analoge Start-up-Programm eines alten CDC 6600 Computers aus einem „toten Anfang“ zu booten. Dies lädt in Johns eigenen Worten metaphorisch dazu ein, einen "Neustart von den Herausforderungen, die das Leben mit sich bringt" zu beginnen.